The Gliderol Series B Roller Doors is a very cost-effective roll-up door system with a proprietary motor operator that is fitted within a drum roll. This door system comes equipped with electronic controls that allow easy interfacing to access devices. It is a counter balanced system which can be custom programmed to be manually operated. 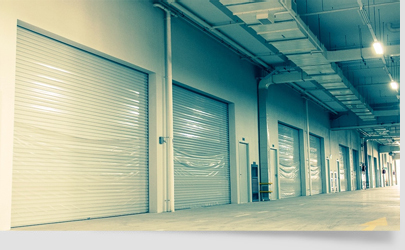 Gliderol Series B Roller Doors are designed for industrial door openings. Available in both manually and electrically operated models, these doors are suitable for openings up to 6 m wide x 5m high is a single panel. For wider openings or if desired, a series of smaller width doors can be fitted, linked by removable centre mullions. The door is substantially lighter than conventional roller shutters, achieved through the use of continuous sheet curtain material and nylon components. Superb counter-balance, coupled with a 1 to 4 planetary gearing system enables the door to be manually operable with much less effort. Operation speed is more than 10 times faster than conventional systems. In electrically operated models, the door is powered by the Industrial GLIDERMATIC, a purpose-built patented motor operator which drives the door directly. The system has excellent features and is a most efficient and cost effective motor operator available for industrial doors.